Woven fabric is produced with interlacement of warp and weft yarn. The importance of woven fabrics increases constantly. Starting from traditional uses mainly in clothing applications, woven fabrics today are key materials for structural, electronic, telecommunications, medical, aerospace and other technical application fields. 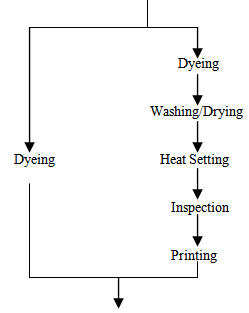 Woven fabric dyeing process is different from knit fabric dyeing process. Jigger dyeing machine is used in woven dyeing. 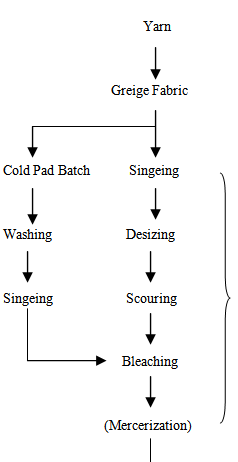 Here flowchart of woven dyeing process is given below. Remarks : Better to use same lot of greige fabric from same supplier for one order. * Stretch fabric need test shrinkage after each step of Scouring, bleaching & Mercerization. Checking point (Finished fabric): Final fabric inspection according to our fabric inspection guidline. Checking point (Package) : Label including order no, width, composition, color, bale no.